2NE1 recently touched down in New York and American Blackjacks are going crazy, but for good reason. 2NE1 will be performing in NYC on Dec.12th for the first time in order to celebrate their win as MTV Iggy’s “Best New Band in the World”. Now American Blackjacks and YG Family enthusiasts alike are voicing that they want a YG Family world tour, and they want it now. I’m not even going to lie. 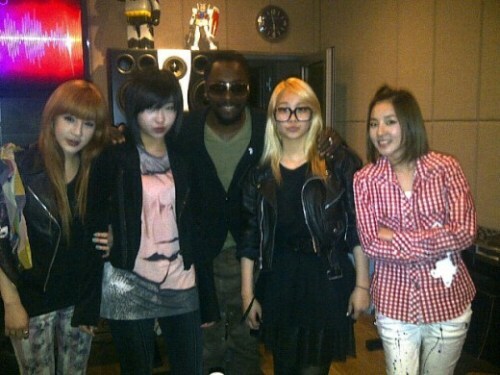 When I first saw 2NE1, I thought they were a bit… poser-ish, but I couldn’t help but love their music. It was fun, energetic, and their style was so off the wall. As time passed, their style eventually changed to cater more to them. Also I wasn’t so strung up about the fact that they sort of fetishized hip-hop because EVERY country has popular artists that portray images that are not true to their personality, or is not really representative of them in real life. They, like many artists, represent the feeling or image people wish to portray to the outside world. Which in their case is a confident, no nonsense chick that goes through heart break from time to time, but also takes crap from no one. I mean which girl doesn’t pretend to be in a music video portraying the images these girls do? YG is using this factor along with their NYC event as a stepping stone to build buzz for 2NE1’s advancement next year. People say they will flop, but I honestly don’t think so. They may not get Britney Spears big, but I think they will be successful none the less. Praise over 2NE1 has been pouring in left and right from the U.S. audience. Their album topped the U.S. iTunes Hip Hop charts when it was first released and they also have a legit following which contains big names in the business. This includes Nina Dobrev and Kat Graham from the Vampire Diaries, Jeremy Scott, Perez Hilton, Flo Rida, Far East Movement, Ludacris, Dr. Dre (who I heard gave them the custom made beats in their “Fire” MV) and Snoop Dogg. And they’ve definitely got Will-power, aka Will.i.am (see what I did there). Say what you will about Will.i.am, but there’s no denying that he has major influence. I feel like his popularity has declined a little over the years, but that’s mostly because of his group’s recent hiatus. I mean the man and his group have a video game (The Black Eyed Peas Experience) out for goodness sake, and people don’t get video games unless they’re BIG. Plus, people have already taken a liking to the little bit of one of the songs he produced for 2NE1, Love Lasts Forever, that we saw being recorded in Season 2 of 2NE1TV. Also, whether you’ve realized it or not, the American hip-hop community (which includes Will.i.am) has really taken big steps to get more Asian artists exposed in America. Tyga (featured on Chris Brown’s “Dueces”) has a new rap protégé by the name of Honey Cocaine (Yes, that’s really her stage name). Teddy Riley is taking steps to advance SNSD in America. Taeyang is working with the Underdogs to produce his album. JQT is also working with Melvin Brown. Se7en worked with Darkchild, while BoA worked with Sean Garrett. Rain was supported by P. Diddy and Usher during his concert performances and Akon featured on Wilber Pan’s song “Be With You.” Rolling Out Magazine named Tiger JK one of the “10 Hot International Hip-Hop Artists You Need to Know” and JYJ also worked with Darkchild and Kanye West to produce their international album. So, if 2NE1 can get enough buzz going around them, they will certainly have a chance of being successful. Another thing working for 2NE1 is the fact that their fan base is more diverse than any other group in K-pop. I have seen people from all walks of life enjoying their music. YG Family images have popped up in the most unexpected places in the U.S. which include wrestling arenas, conventions, and a TV commercial. There is even a house light show in Austin, Texas playing to their music. If Blackjacks’ love and devotion is any indication, then 2NE1 is headed on the road to success. Are any of you going to see them perform? Let us know.